That ancient Arabic proverb speaks a powerful truth. 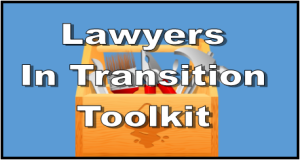 The words are especially important for lawyers facing a transition. As you prepare for your post-practice future, health planning should be a top priority. After all, even if you’ve laid a golden financial foundation, it will amount to little if you’re not healthy enough to enjoy it. Keep in mind the two keys to healthy aging: (1) leading a healthy lifestyle and (2) being an informed health consumer. Both of these are within your control. The basics of a healthy lifestyle – diet, exercise, rest, social interaction and moderate habits – can not only be maintained after you leave the law, but enhanced through additional free time and flexibility in your schedule. And who better than lawyers to make informed choices about health care? Take an hour to review your health insurance policy. Are any changes needed? Schedule an appointment with your insurance agent to discuss coverage options. Are you planning to move? If so, you’ll need to find a new doctor. Do some homework in advance. Scout out the closest hospital, pharmacy and emergency care facilities. A Personal Health Inventory (PHI) is a great way to bring awareness to all aspects of your health – body, mind and spirit. Here is one used by the U.S. Department of Veteran’s Affairs. It covers subjective issues (feelings, values, aspirations) and objective concerns (medications, surgeries, treatments). One section of the VA’s PHI explores “Where you are and where you want to be.” After completing the Personal Health Inventory, you can talk to a family member, doctor or friend about areas you want to work on or learn more about. Another valuable tool is the Wellness Wheel. This visual guide will help you better understand the seven dimensions of your life that make up your overall health. Unlike traditional health inventories, the Wellness Wheel includes financial and environmental factors, in addition to mind and body. Assessing needs in the seven areas can help you prevent future problems and make healthier choices in your everyday life. The decisions you make when you start your law career will determine the quality of your health as you transition out of it. With that in mind, cultivate interests and relationships outside the law. You can lean on these for support after you handle your final case. Develop life skills like goal-setting, conflict resolution and collaboration, which will prove invaluable during your transition. Seek out opportunities that force you to keep learning and growing. Establish healthy habits. Join a gym. Learn about medical conditions like hypertension and diabetes that can take a major health toll down the road. Do a Personal Health Inventory. Or give the Wellness Wheel a spin. Have fun with it. Make it a group effort by including your loved ones. Be an informed health consumer. Learn about the physical changes that occur with aging and those that are caused by disease. Educate yourself on illness and disability. Study treatment options and weigh the risks and benefits of each. Know where and how to get health care when you need it. Pay attention to psychological concerns. All changes – even positive ones – are stressful. Leaving the law can bring a loss of identity. You might miss the mental stimulation, the emotional rewards and the social contacts. Find ways to fill these gaps. The American Psychological Association offers a wide range of free resources to assist you in this regard. Get out of your head and get outside. Fresh air, sunshine and a long walk might be just what the doctor ordered. Stay positive. All medical experts agree that a positive attitude is a key to good health. View your career transition not as a loss but a gain. You will have more time to spend with your spouse and loved ones and more freedom to do new things.